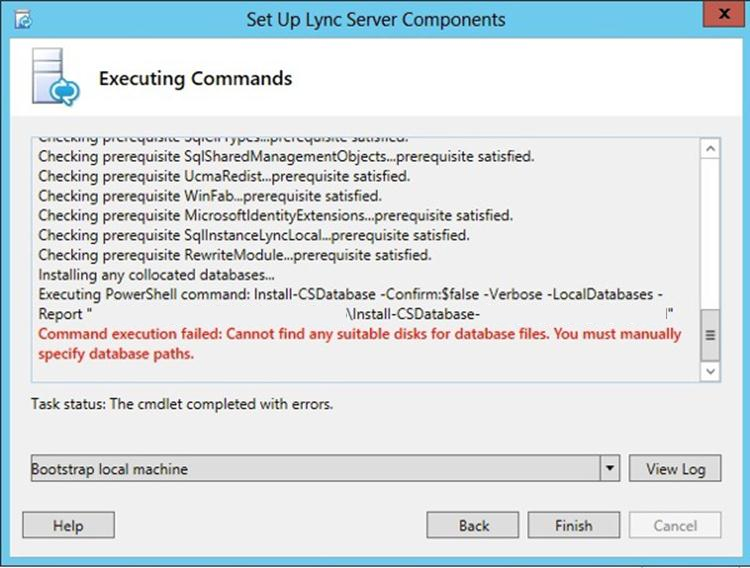 I was adding a new front end pool to a customers Microsoft Lync Server 2013 deployment recently, when I came across an issue when attempting to implement pool pairing between two Standard Edition servers. On completion of the backup service MSI being installed, I received the error “Command execution failed: Cannot find any suitable disks for database files. You must manually specify database paths.”, as illustrated below. It became apparent quite quickly this issue was related to the available storage on the virtual machines C:\ drive, while there was sufficient space to perform the front end installation the addition of an extra component was a step too far in terms of required storage. In this case, the customer had provisioned a 50 GB local hard disk drive, which is under the recommended 72 GB required for the deployment. On expanding the local hard disk drive to 80 GB and running the Lync Server Deployment Wizard an additional time, the error was no longer apparent. This was a good example of ensuring any virtual or physical machines utilised for Microsoft Lync Server 2013 roles need to conform to the minimum hardware requirements in order to avoid potentially time consuming issues. That’s it! OCS	Command execution failed: Cannot find any suitable disks for database files. You must manually specify database paths, Deployment Wizard, Lync 2013, Microsoft Lync Server 2013, Storage, The cmdlet completed with errors.